Create a comfortable ambiance with the Green Creative 40681 A19 LED light bulb. 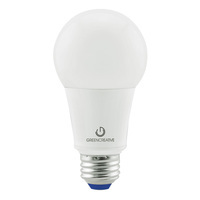 This 6-watt LED can save up to 80 percent on energy costs when compared to a 40-watt incandescent lamp. The 40681 A19 bulb emits a warm white light at an omnidirectional beam angle of 340 degrees for its 480 initial lumens. Ideal for reading lamps, ceiling fans, or entryway lighting, the Green Creative typical A-shape lamp is the perfect fit.